Working aged men (25-54 years old) account for the largest number of suicide deaths in the U.S. These men are also the least likely to receive any kind of support. They don’t talk about it with their friends. They don’t share with their family. And they rarely seek professional treatment. • Men represent 78% of all U.S. suicides. • Men are four times more likely than women to die by suicide. • 90% of people who die by suicide have a mental disorder, a substance abuse problem or both. 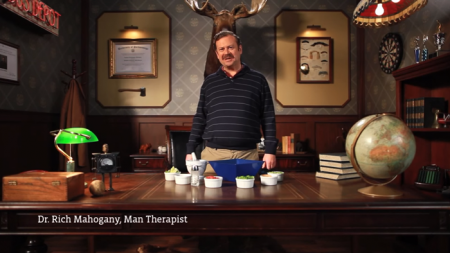 Part of a multi-agency effort, including the Colorado Office of Suicide Prevention » and Cactus », Man Therapy® is giving men a resource they need. A resource to help them with any problem that life sends their way, something to set them straight on the realities of suicide and mental health and, in the end, a tool to help put a stop to the suicide deaths of so many of our men. To learn more about the research behind the campaign, please read Man Therapy: An Innovative Approach to Suicide Prevention in Working Aged Men ». To learn more about campaign achievements and outcomes 18 months after launch, please read Man Therapy: Outreach and Impact of Men’s Mental Health Program 18 Months After Launch ». To view videos and to learn more, visit the Man Therapy website. Since 2010, Stark County’s suicide rate has been above the national average. In addition, the suicide rate in Stark County grew more than 20% in 2016. As a result, local funders are partnering to address suicide prevention in our communities and contributing a total of $350,000 to address the year-over-year increase of suicide deaths in Stark County. Designed to address a comprehensive need for coordinated awareness and education in Stark County, this collaboration of funders aims over the next three years to concentrate resources and efforts at those areas most likely to raise public awareness, reduce stigma and ultimately decrease the number of Stark County residents completing suicide. A community assessment to identify service gaps and determine the best ways to reach the community. Information gathered during the assessment will then be used to devise a concrete plan of action. Training in consistent, best-practice methods of screening and treatment, and universal implementation of suicide probability assessments. Particular attention will be paid to individuals released from the hospital after a suicide attempt, when their chance of another attempt is at its highest. Expansion of community partnerships and implementation of mass marketing and social media campaigns, to educate and reduce stigma. This will include efforts to increase awareness of the Stark County Crisis Text Line, because of its appeal to younger populations. Renovation of the Crisis Center’s stabilization unit to ensure that it meets evidence-based environments of care recommendations. Studies show that the care environment is a critical part of recovery. Establishment of a fatality review board to aid in future prevention efforts.